OMG! Greg Brown (the fiddle player in this photo) just sent me this picture. 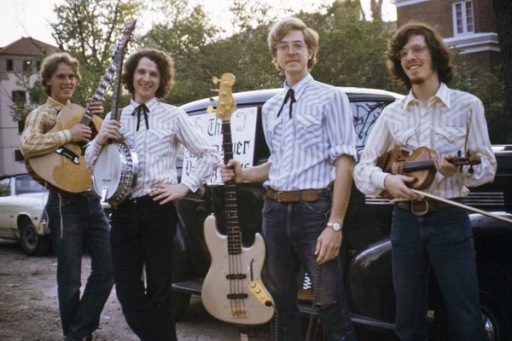 It is the Yahara River Valley Boys, a bluegrass group I played with from 1972-4 in Madison Wisconsin. The photo looks vaguely like the Flying Burrito Brothers. Are these wholesome lads or what? L-R: Roger Bourland, Ed Fyffe, Jamie Shelton, and Greg Brown. Any inspiration from those ever Beatle lovin’, Charles River Valley Boys? Clearly one golden boy in the bunch! Let’s hear it for big hair.